Some good excercise walking up the 110th most prominent peak in Washington. 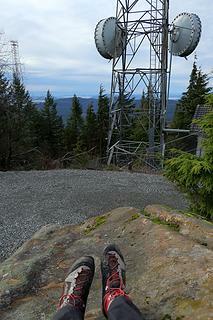 Lookout Mountain is a long mountain with three highpoints, each of which had a fire lookout tower at some point. 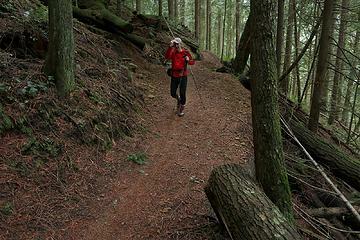 The Lookout Mountain Forest Preserve is a pretty nice forest that makes a road hike almost seem like a trail hike. No views but the open forest below a high canopy is interesting. 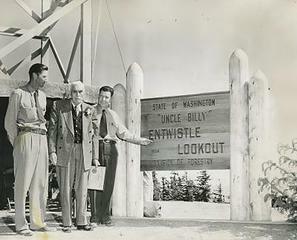 One of the highpoints was named after the first fire warden in all the west, William 'Uncle Billy' Entwistle who was hired in 1908 by the Washington Forest Fire association as its first fire watcher. He was at the dedication in 1954, he was 90 years old. It is a long walk. When I went up Lookout Mtn I used a bike for a fun ride down. Long ago I got my wife and pre-teen kids to the north summit via the road walk by saying (lying) "half a mile more!" Works great for one hike, and one hike only, after which they figure out the scam. BTW, there is a great but super steep expert bike trail, now "officially" decommissioned for bikes (the constructed jumps and gaps are considered too dangerous by park folks) but still hike-able, that makes for a shorter hike. 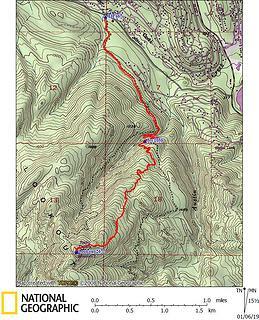 It more or less parallels to the east of the creek the road/trail shown on Eric's map northeast of the north summit. 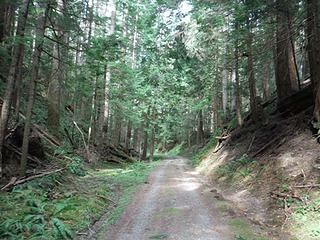 The lower start is easy to find from the road, being on the right at the first lefthand switchback past the creek. The upper junction is harder to find but is to the descender's left about 50 yards down the road as paced from the rocky top on the north summit shown in Eric's picture (about where the letter "f" in radio facility is printed on the map). Yes, my wife has learned to double all mileages I give her. The lower entrance to that short-cut trail had a sign saying "trail closed". Wasn't planning on going that way but now it makes sense why it was closed. The trails upper exit near the summit isn't marked as you say. I came across it while checking out the woods looking to see if that 1931 picture was taken from a small knob hidden in the woods. In fact, I found brand a new "trail closed" sign hidden in the bushes. That is one of my favorite local trails! If you keep going you can go down the front side and make a loop of it. 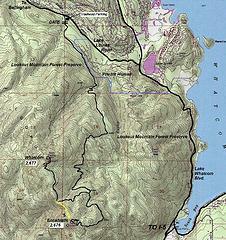 You can download the gpx tracks for this 8 mi loop if you so desire. Thanks for posting. I enjoy reading about your continuing lookout explorations. I followed the bike trail that Brushbuffalo suggested above. It makes a fairly pleasant hike, ascending steeply through second-growth forest, following a nice babbling stream most of the way, with just a few stretches of mountain bike trail silliness where it went straight uphill so the bikers could make suicide runs downhill. The bottom end is easy to find, marked by a "closed" sign at the first lefthand switchback after the stream crossing, at 1.6 miles, circa 1000 feet. 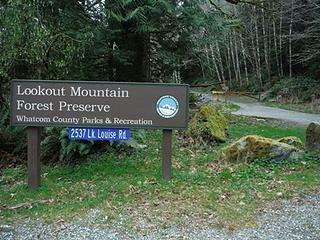 (That's starting on the road from the Whatcom County Lookout Mountain Forest Preserve trailhead.) The top end is very obscure. There's an obvious trail starting from the road just below the towers, but that's the trail that leads north toward a different road, which would probably be a good loop. 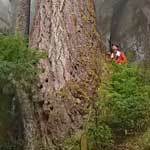 The upper entrance to the forest trail comes out by a faint white mark on a tree about 50 feet lower, obscured by brush, and goes uphill slightly to follow a rib westward parallel to the road. 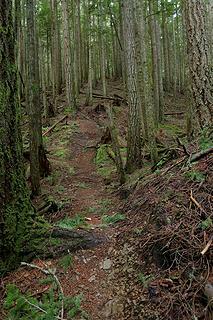 One of my favorite trails on Lookout! It is called Stumpwater if interested. Beautiful woods on that one! Just a note, this is now Whatcom County Park and when talking with them they said the trails were closed to bikers but not hikers. We are free to hike. Not only is this gap, which is considerably wider than the image reveals, designed to propel the rider beyond the log, but the really 'expert' experts probably do a backflip while airborne. 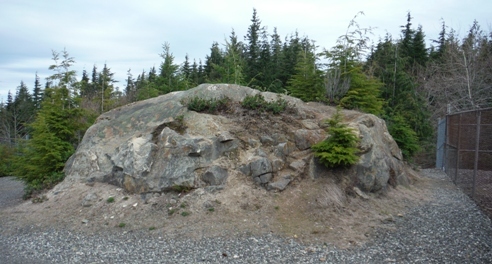 The short log banked with soil perpendicular to the trail is the launch pad, and the landing is just beyond the two white stones beyond the big log. The rider would be 10-12' above ground and would hope to clear about 30' on this jump.There are bikers in this area who have that capability...and nerve/ craziness. If you hike up ....or down, but especially UP....any of these expert downhill bike trails, be very alert....listen and look and MAKE NOISE, because a bike will be right there within seconds after you are aware of it, and the rider will probably not suspect a hiker or runner is ascending 'their' trail . Never climb up one of the blind jumps right in the landing zone, but instead go around on the soft forest duff. If a biker flies off a bump and you are in the flight path ...and I do mean 'flight path'...they easily go 20-30 feet on some of these tricks, and it will end very badly. I went up Stumpwater two days after Matt's hike and there was four inches of new snow on top. 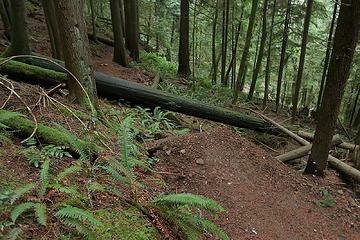 And there was evidence that one or more riders had recently ridden down the trail. "CLOSED" doesn't always mean "no one goes here." I don't personally object to these trails, since they are biker- built and make great training routes for super steep sustained climbing on foot. 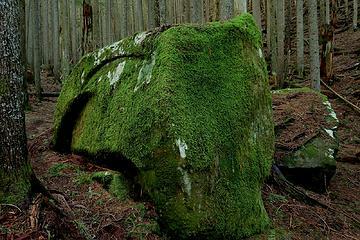 It is unfortunate that they often become deeply eroded within a few years.